Tripp Lite P139-06N-DP converts a Mini-Displayport video out port on a MAC, or other computer, to Displayport, allowing attachment of a Displayport monitor or HDTV with Displayport input. Plug the adapter into the computer, and then a standard Displayport cable from the adapter to the monitor. 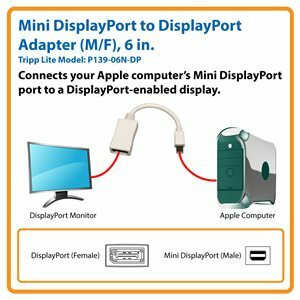 The Tripp Lite P139-06N-DP Mini DisplayPort to DisplayPort Cable Adapter (M/F) is an excellent replacement for an existing cable that is lost or worn out. It also allows you to use your existing DisplayPort monitor with a new mDP computer without the expense of buying a new monitor. This adapter connects a DisplayPort-enabled monitor or projector to the mDP port on your computer or laptop, making it ideal for converting a video signal for presentation on a DisplayPort display. The P139-06N-DP adapter is completely plug-and-play with no software or drivers to install. It supports resolutions up to 2560 x 1600 for rich, crystal-clear video. It’s also compliant with DisplayPort 1.1 and HDCP. The six-inch molded cable features premium foil and braid shielding to deliver reliable, error-free signal quality and protection from EMI/RFI interference. Molded nickel-plated connectors with gold-plated copper contacts ensure excellent conductivity. Integral strain relief guarantees the cable and connectors last a long time. A rugged PVC jacket protects twisted 32 AWG data lines and 32 AWG power lines. The P139-06N-DP comes with a lifetime warranty. It’s manufactured in compliance with strict RoHS specifications, reflecting Tripp Lite’s commitment to environmental responsibility. P139-06N-DP Mini DisplayPort to DisplayPort Cable Adapter (M/F), 6 in.